I tried out Pomegranate and Patchouli to see what I thought. With a shampoo, conditioner and hair mask in the range it covers all aspects of hair cleanliness and moisturising. The products all smelt really fresh and natural due them being packed with essential oils giving hair extra strength and vitality which is what I need with long hair that I regularly blow dry and straighten. The pomegranate adds shine whilst the patchouli oil gives an intense boost of hydration which leaves hair soft. I’ve been really happy using this bargain priced organic range which leaves my hair perfect for everyday, be it on the school run, at work or out at the weekend. The Organic Shop products are simple to use – I love the pump bottles for ease of use in the shower – smell great and leave hair clean and fresh. Knowing that there’s no harmful microbeads, no parabens, no SLS, no mineral oils and no GMO’s is a great bonus and of course completely free of testing on animals. The packaging is recyclable and the price is great value for money – what more could you want? Overall the Organic Shop range of haircare fits perfectly in with supermarket shop at Tesco and is something I’ll happily grab whilst I’m there. An added bonus is that Organic Shop are running a fantastic competition at the moment to win an amazing 7 night holiday to Aruba in the Caribbean – check HERE to find out how to enter! Rocks Sparkling Elderflower Drinks are part of a range of ready to drink individual bottles from Rocks. With a gentle Elderflower flavour and sparkling texture these are perfect for Summer days whether at home in the garden or out and about on a picnic. The drinks are primarily made with a majority of Organic ingredients and also stick to a simple list of ingredients making them uncomplicated but naturally tasty. I just love the gentle sparkle included which for me always makes a drink a bit more fun and refreshing. My mum is a big fan of Elderflower so we tried these new drinks together served chilled from the fridge and found them to be the perfect afternoon refreshment. We both enjoyed the flavour and fizziness within it. I hadn’t heard or tried Rocks drinks before now and seeing as they are locally made in Devon, I’ll be sure to look out for them again in the future. Other interesting flavours in their ready to drink range include Sparkling Raspberry & Lime which sounds delicious, along with Sparkling Ginger & Wasabi, Sparkling Strawberry & Blackcurrant and a couple of still options. There really is a flavour for everyone so definitely check them out if you come across them. Daniel Galvin Jr’s range of hair care products are all made with a high proportion of organic ingredients and provide high quality hair care that is a pleasure to use and treats your hair well. The Organic Head Brunette Shampoo and Conditioner are especially formulated with Daniel Galvin Jr’s exclusive brunette blend including sage to gradually darken brown hair, elderberry to add richness and lustre to darker locks and black tea to enhance chestnut tones. I was looking forward to trying out the Brunette Conditioner on my long dark hair to see how it performed. The conditioner comes in a generous 250ml size tube that is easy to dispense and perfect for standing on the side of the shower or bath. Made with 70% natural ingredients, I have to say when it is dispensed from the tube it does look really nourishing and wholesome. With a creamy beige thick looking consistency I was eager to try it out on my hair. After shampooing I applied the product and it’s thick creamy texture was pleasant and hydrating on my hair. It felt very luxurious and nourishing really giving my hair the boost it needed. The Daniel Galvin Jr Organic Head Brunette Shampoo and Conditioner is a really competent and quality product that I’d happily use after every wash. It packed my hair full of hydration, left it super soft with added shine and richness. I haven’t used it long enough to see how well the brunette enhancement performs but the Daniel Galvin Jr Oh! Conditioner itself has a rich feel to it and is definitely a product that suits my hair type and leaves it feeling luxuriously soft, smooth and well cared for! FaceTox is a highly powerful detoxifying face mask that will leave your skin looking squeaky clean, pores look fresh and clear and your whole facial skin looks totally refreshed and recharged. I couldn’t wait to try this out to give my skin a treat and help to keep it tip top condition with the ageing years upon me. The set of masks is presented in a box with everything you need to apply the product. I received a set of 7 masks each of which requires two sachets, a mask mix and organic rose water which is mixed together before use and applied to your face. Also included is a small bowl and spatula to mix the mask up in, and the spatula can then be used to apply the mask to your skin. The organic rose water smells utterly divine and I couldn’t wait to add it to the mask powder to create my mask. The sachets contain the perfect amount of ingredients so it’s a case of just tipping them all into the bowl and mixing it up until it resembles a thick, mud like texture. The mask feels quite cold and damp on application but you leave it for 30 minutes to dry out during which time you will feel your skin become tighter as the mask draws out all the impurities, toxins and unclogs pores. It requires a little bit of effort to remove the mask, but I have to say the results are worth it. My face looked exceptionally clear after and felt really smooth, soft and firmed. The mask really does work it’s magic and has a powerful effect at deep cleansing the skin. I would definitely use this again to give my skin a boost and thorough clean, the results are far superior to more basic masks I’ve used in the past. FaceTox does what it says on the box, a complete detox for you face – give it a try today! When it comes to looking for high quality, great looking products for children and babies, there are some great brands out there that really care and use the best materials to produce their goods. I have been lucky to try some for myself over the last week and I have to say they are all fantastic and I’ve discovered some great brands that I hadn’t tried before but wouldn’t hesitate to go back to. First up we have Frugi, which although I had heard of, had not actually seen any of their clothes first hand. I have to say, the quality of them is second to none, all being 100% organic cotton and quite literally the softest, thickest cotton in children’s clothes I have seen in a while. You can also tell from the cut and finish that these are well made and I couldn’t wait to fit my children into some of the new pieces from their Summer collection. Mister B had a stripey t-shirt to try out and thought the applique design of a seagull listening to his headphones with his backwards cap on rather amusing. Miss M had a playsuit, which is right up her street for her style. Both children simply loved their outfits, they are so comfortable and I must say a really good size for their ages. Normally we need to go a size up, but these are a generous cut and being so soft, are so easy to wear against their skin. I have been very impressed with Frugi and will definitely be checking out future seasons with them. Belle & Boo is simply the most gorgeously branded homeware goods for kids that I have seen in a while, with a unique, old fashioned storybook style that reminds me of my childhood. The collection centres on a girl called Belle and her bunny friend boo as well as many other characters suitable for both boys and girls. We received some products featuring Belle and I just adore them. They have a retro feel and are made to a really high quality, making them ideal for beautiful gifts. From their stationery ranges we had a writing pad, shopping list and set of notebooks. They are all lovely to write on with a cute design in each corner. The set of notebooks features a different picture on each cover. This framed print is so cute and will look lovely on Miss M’s new bedroom wall. It’s a classic piece of wall art that looks timeless and suits a young girl’s room perfectly. Belle & Boo covers a large range of items such as cute kitchen items for girls, bedding, party pieces and also some rather lovely pirate themed items too – well worth checking out for that special gift! The Piupia polo top for babies/toddlers is made from organic cotton so is super soft, just what you want to put on to little ones skin. The top is well made, a really good cut and features buttons down from the top to help get on and off easily. The pattern is modern on a neutral background so will fairly much go with anything and being unisex is great too. Cheeky Chompers features a rather fine array of teething accessories, in fact some rather clever ideas such as the Neckerchew. All the fabrics look gorgeous and comfortable to wear at the same time. We received the Chewy the Hippo teether who I have so say is rather charming. He’s a really good size for grabbing onto and has a soft latex body for chewing away at. He also squeaks if you give him a squeeze. He also has a rather lovely velcro strap to attach him to wherever needs be, car seat, pushchair etc. Kokoso baby is a multipurpose moisturiser made from 100% natural and organic coconut oil. It really is a high quality product to help soothe and protect baby skin. The product itself is quite a solid product but once warmed between your fingers it softens and melts ready to be absorbed straight into the skin to work it’s magic. Perfect for sore bottoms, baby massage, dry skin and much more this is definitely worth a try. One thing my children look forward to each day is snack time, so I’m always on the lookout for healthy options that they can enjoy but something a bit different. I was delighted to try some Organic Soft Apricots from Crazy Jack. When I opened the packet, my two children peered in excitedly but they looked a little disappointed as they were expecting to see orange apricots. These apricots from Crazy Jack are naturally dark, more brown in colour than you would normally get from dried apricots. I encouraged them to try one and two year old Mister B got stuck in and his first words were “Mmmm, yummy in my tummy”. Miss M not wanting to be left out had a taste and agreed, she really enjoyed the flavour. Between them they devoured over half the pack before I took it away to try some for myself. I found them to be very tasty, almost a toffee like flavour to them that made them moreish and the perfect healthy snack that both children and adults can enjoy. With a soft texture they are easy to bite through and don’t get stuck in your teeth. Not only are these organic, but are naturally high in fibre and a good source of iron too so plenty of plus points. I love it that the children can enjoy fruit in a different form, it keeps things interesting but also these apricots are handy to keep in the cupboard and use for snacks both at home and away. We highly recommend these apricots, after all my children wouldn’t devour over half a pack in one sitting if they didn’t taste good!! Most of us have that feeling of tired, uneven, stretchmark ridden skin after having children so finding a product that makes you feel better and more confident in your skin is always a bonus. 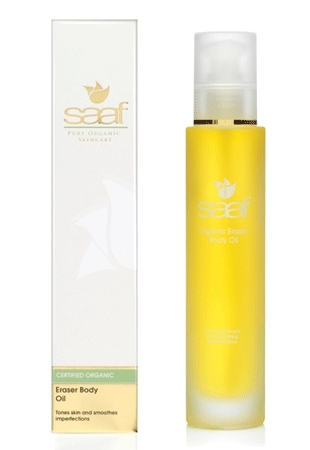 I was sent Saaf Eraser Body Oil to try which aims to be “Natures correction fluid in a bottle”. This toning and smoothing oil contains a high percentage of Rosehip Seed Oil which is known to effectively reduce uneven pigmentation and the appearance of raised scar tissue, along with Safflower Oil which soothes skin irritations while increasing the moisture content of the skin. The blend of Safflower and Rosehip seed oils is very rich and quite greasy to the touch, although that does mean a little goes a long way. I found it very easy to massage into my skin and it did absorb but best to leave it 5/10 minutes before getting dressed. I found after a bath at bedtime was the best time to apply as my skin really seemed to appreciate it and I could let it sink in. It has a rich citrusy fragrance due to one of it’s key ingredients Mandarin Oil. The results were really impressive and with just a week of trying the Saaf Eraser Body Oil, my skin feels a lot more supple and toned. I used primarily on my thighs and stomach area and this left my skin feelin really smooth and soft to touch and definitely looks more radiant and bright rather than dull and dry as it did before. This has definitely helped to improve my confidence in my skin and I look forward to see more results in the coming weeks. Just to mention that the tall glass bottle looks great too, perfect to leave on your dressing table which is handy as you won’t forget to apply the oil each night. Saaf Eraser Body Oil is a great product to improve skin tone especially on stretchmarks whether through pregnancy or weight gain and give your skin back a healthy glow to help boost body confidence.